Home Wellness Guide Latest Hyperbaric Oxygen Therapy wound healing: A myth or a fact? A wound either heals by itself or with some medical interventions. This is what we all expect. But what about those wounds that take a too long time to heal raising the risk of complications? For example, as in diabetics wound healing is a real problem upping the chances of gangrene and amputation. Lack of oxygen slows down the recovery of wounds. Hyperbaric Oxygen Therapy (HBOT) is considered as a more effective treatment where increased exposure to oxygen can quicken the healing. Initially, the therapy was applied to treat Decompression Sickness of scuba divers. 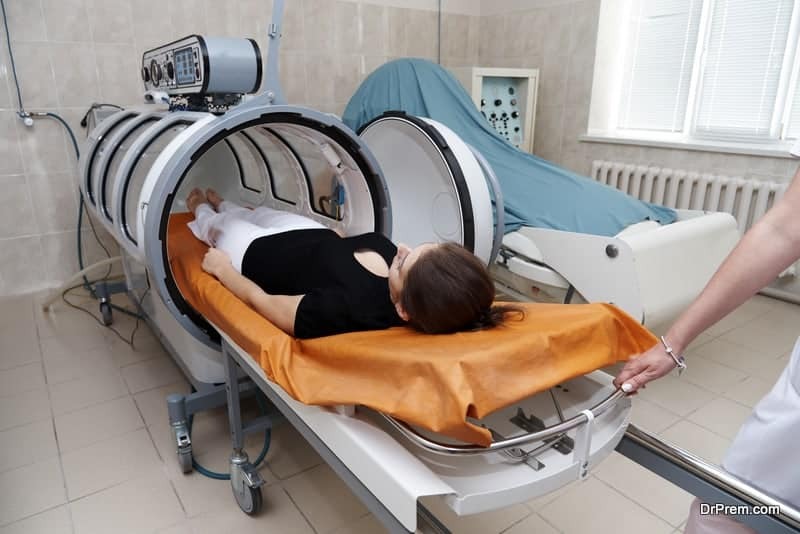 Although HBOT seems to provide a great solution to non-healing wounds, contradictory research reports often leave the patients confused whether it is a fact or myth. Another important point to note is not all wounds can be healed with HBOT. Air that we breathe in contains 21% oxygen. 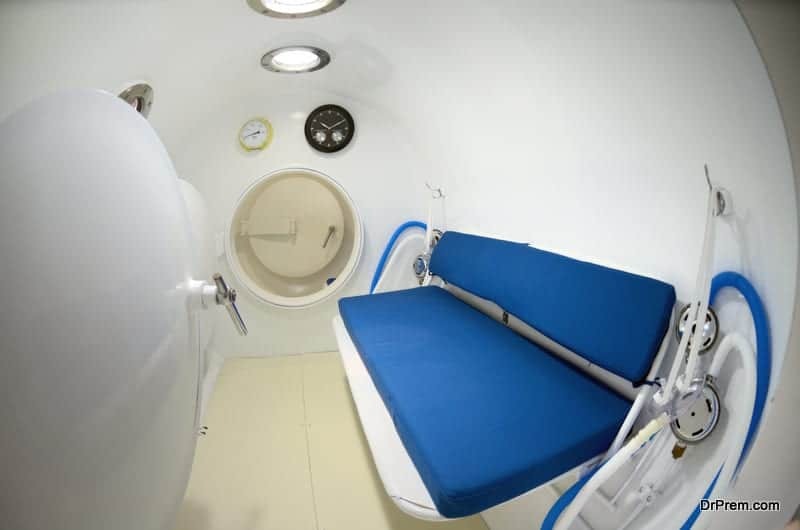 In HBOT, the patients are exposed to 100% compressed oxygen in a chamber. Pure oxygen gets saturated in the blood increasing the oxygen supply to the tissues resulting in fast healing of the wound. Enhancing collagen build up and migration of epithelial tissues. Reducing edema in local tissues. Facilitating angiogenesis or creation of new blood vessels improving blood circulation and other factors of healing in the wound. The health care provider should recommend whether HBOT would be the right option to treat your slow-healing wound. Patients are introduced into a specially designed chamber known as the Multiplace chamber or Monoplace chamber. The former allows multiple patients to be treated at the same time while in the later only one patient can be treated at a time. The patient wearing a 100% cotton gown is asked to lie on a table that will slide in a monoplace chamber. The chamber is a transparent plastic tube 7 ft long. The patient is asked to relax and breathe normally when the therapy is on. One can watch TV and listen to music as well. The patient can converse with the therapist and the therapist also keeps a watch on the patient. The chamber is then sealed and filled with pressurized oxygen which is 2.5 times higher than the normal pressure. The patient may experience mild discomfort in the ears which is quite normal. The duration of the therapy may vary from 30 min to 2 hours. After the scheduled time period, the pressure will be reduced in the chamber and the patient will be taken out. The effectiveness of Hyperbaric Oxygen Therapy in healing wounds was discovered accidentally in the 1960s. Later, scientists dug deeper to understand how and to what extent the therapy works. In a 2008 research report from the scientists of Kings College Physician Assistant Program that was released in the Internet Journal of Academic Physician Assistants studied the benefits of HBOT in non-healing wounds of diabetics. The results showed HBOT did not have any significant impact or long-term benefits but can be used as a means to postpone amputation. In 2012, a study report presented in the Journal of Anesthesiology Clinical Pharmacology proved just the opposite. The study conducted by the Postgraduate Institute of Medical Education and Research with a small number of participants found compared to conventional care in chronic non-healing wounds that resulted in 26% reduction of the wound area, with HBOT it was 59% reduction. In a real-life application, a clinical setting of HBOT in the Wound Care & Hyperbaric Center in Lansing, Michigan was in the spotlight in a state journal in 2015. 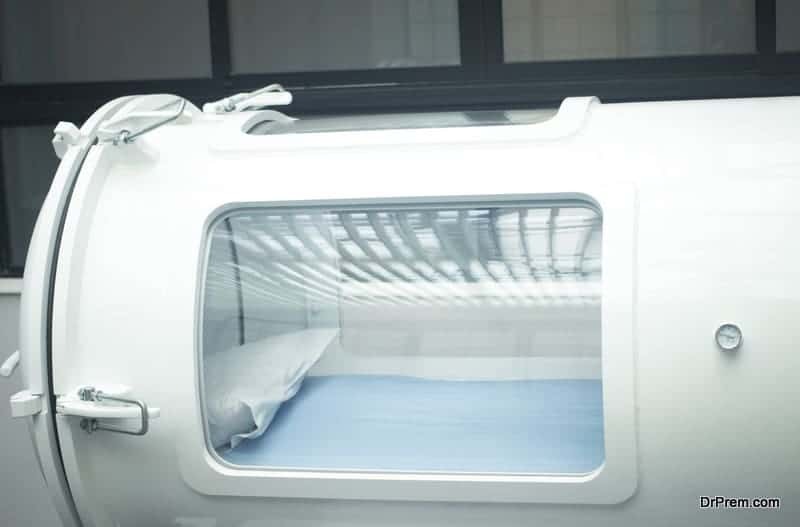 The center applies HBOT for almost every type of wound ranging from arterial ulcers, non-healing diabetic wounds, and postoperative complications to venous insufficiency ulcers. The outcomes are highly satisfactory as revealed from the growing patient footfalls. The National Center for Biotechnology Information (NCBI) in an article confirms the successful application of HBOT as an adjunct treatment in the healing of wounds. Myths regarding the effectiveness of HBOT in curing cancer perhaps have created more confusion. Lots of research has been conducted that resulted in mixed or inconclusive results. Nothing definitive can be said about long term benefits of HBOT in curing cancer. 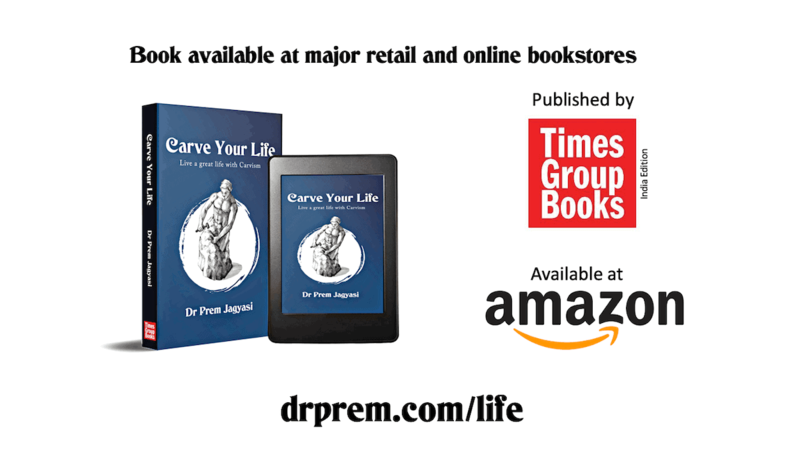 Studies have shown oxygen starvation can foster thriving of some forms of cancerous tumor. Therefore, flooding the cancerous cells and tissues with oxygen can be conceived as a viable cure that would destroy cancer cells. But it is yet to be scientifically proved that providing higher than normal level of oxygen can kill cancer. It would be wrong to consider HBOT as the last resort of treatment which may create a misconception about its effectiveness. Although physicians would try high-quality interventions to facilitate wound healing before recommending HBOT, timely intervention can make a huge difference especially in preventing amputation, which is known to reduce the life expectancy of diabetics significantly. Any proven risk of HBOT? HBOT is normally considered as a safe procedure with rare chances of complications but since every treatment carries a certain risk factor, one cannot claim that this therapy is absolutely risk-free. Some of the proven risks of HBOT include oxygen toxicity, hypoglycemia and associated seizures and vision changes that may last for one and half months post treatment. Since the chamber is filled with oxygen, there are high chances of catching fire. It would be not out of place to summarize the possible side effects likely to arise from HBOT. Developing barotrauma or a discomfort in the ear almost alike to that experienced in flights. Patients can develop tension pneumothorax. Nearsightedness which goes off in a few days. Some patients with congestive heart failure reported additional heart problems after going through Hyperbaric Oxygen Therapy. The risks get aggravated when patients fall prey to tall claims of few clinics and forego or delay the required conventional treatment hoping a more effective cure with HBOT. Not all patients respond equally to all treatments. Often, healing depends on the nature and extent of the wound. 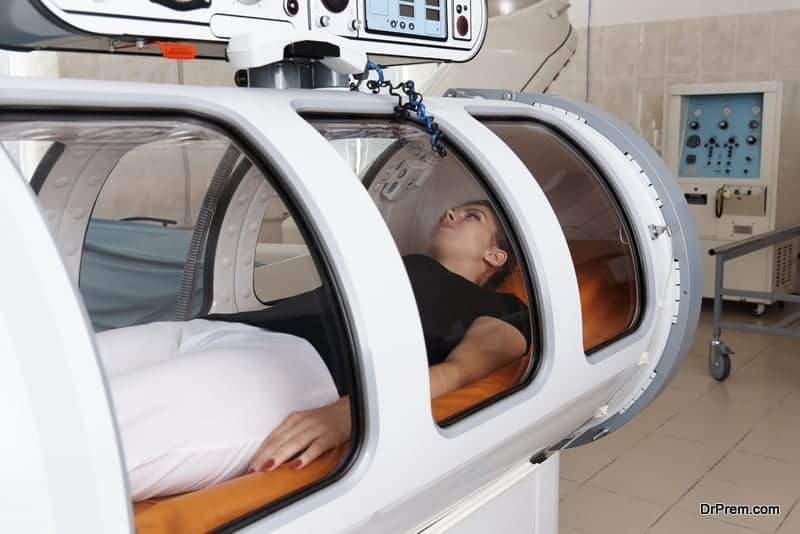 Even if different studies come up with contradictory results, the strong scientific reasoning is quite supportive of the healing power of the Hyperbaric Oxygen Therapy.